Starting over | Can I Bring the Dog? Recently I started an introductory dog training course from the Karen Pryor Clicker Training Academy. It’s an on-line course for “aspiring” clicker trainers. Since I have only trained Chico, and with a lot of help, I decided to start at the beginning. It’s a good review of the basic skills that I’ve picked up over time, and it challenges me to figure out how to do some of the exercises because they are designed to train skills that Chico already has. I try to think of something else that allows me to use the skills the unit is teaching. I’ve signed us up for trials three weekends in a row in June, and I’m starting to eye July and August’s schedules. 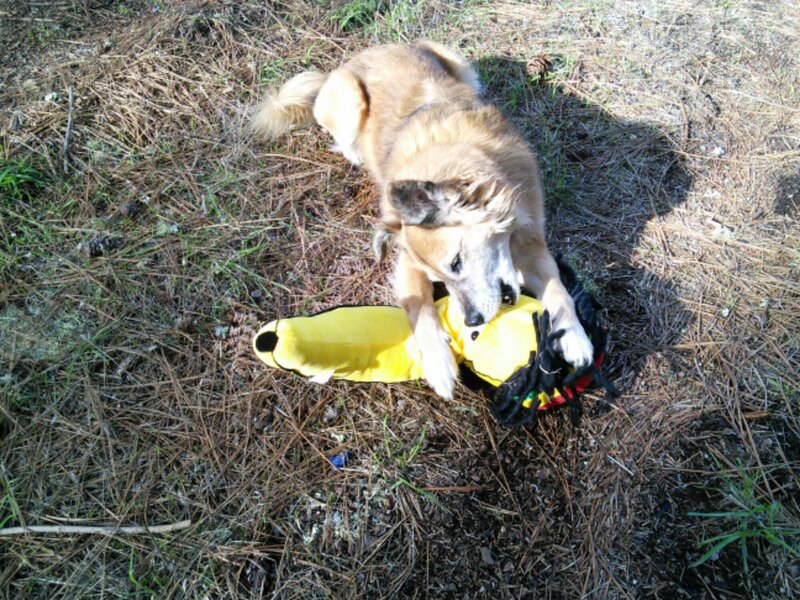 Here’s Chico and the garage sale rasta banana back in Santa Cruz, because it’s hard to be the trainer AND take pictures. This entry was posted in Uncategorized and tagged clicker training, karen pryor, positive reinforcement. Bookmark the permalink.